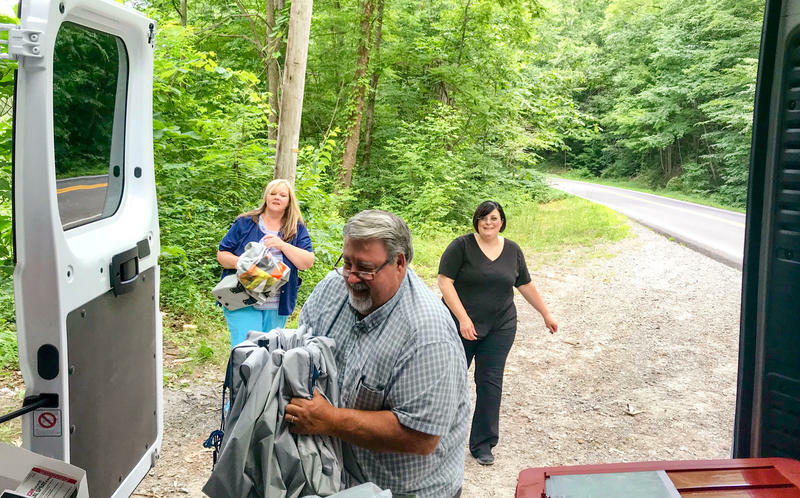 Crystal Simpson, Fred Cox and Gena Carter load up the Wyoming County mobile harm reduction unit van after providing services in Allen Junction, Wyoming County. After a few minutes, a car pulled up and the people inside asked for some supplies. Then, a couple rounded the curve in the road and walked up. They were willing to talk, even to a reporter, about their struggle with addiction. "I have been doing drugs since I was 18. Quit there for a while, went to rehab, and then relapsed," said Rebecca, 35. "Nobody has ever done something like this," she said of the van. "It's my health, and I want to make sure I stay healthy, even though I'm doing stupid stuff." She and her fiance, John, 28, said they both inject heroin and have stopped by the van five times since May. We're using their first names to protect their privacy. "Now there's nowhere near as many people sharing needles and passing the same needle back and forth for each of them to use," he said. Wyoming County, in southern West Virginia, is among a group of counties in central Appalachia that are especially vulnerable to the rapid spread of HIV, partly because of intravenous drug use. The county sees no new HIV cases in most years, Cox said, but last year experienced what he called a "cluster" of them. A spokesman for the state Department of Health and Human Resources said it won't give out county-level HIV numbers because there are so few cases. But there were 57 new HIV cases last year in 15 West Virginia counties, 14 of which the Centers for Disease Control and Prevention consider to be most susceptible to an outbreak. Just the night before, John said, a woman in their friend group overdosed, and he had to revive her with the Narcan spray he got from an earlier visit to the mobile unit. He also found out someone he has used drugs with is HIV-positive, and while John isn't, he said he shared needles with that guy before the diagnosis. "If it wasn't for this program, I would still -- I wouldn't be forced to because nobody is forcing me -- but I would want to use his needle so that I could get high," he said. "That's how an addict's thinking is. Even though we know they have HIV, I would still use his needle if it wasn't for them giving me clean needles, because I would not want to be sick and hurting." The Wyoming County health department bought and customized the van with an $80,000 DHHR grant. Staff drive to two locations in the county every Friday, for at least a half-hour in each spot. They started going out in April, but didn't get any clients until the next month. The van is white and unmarked. Discretion is important. "We've debated on whether we want to put a harm reduction sticker on the side of the van, but at this point, we want to keep it a plain van," Cox said. No one using drugs would want to get these services at the health department in Pineville, the county seat, Rebecca added. It's a half-hour drive away from the first site in Allen Junction, a long drive on these rural roads, and the department is next to the courthouse. Cox and his staff chose the two communities they currently drive to -- Allen Junction and Long Branch -- based on the at-risk populations living there. An earlier location was a controversial choice for some, including Christy Seaton, whose parents live there. "There is no police force there, it's kind of in a rural area," she said of that community, Alpoca. "The police response time when you call for any other issue is kind of a long time. If there happened to be an issue there, it might take the police force a little while to get there." kind of people you want in your neighborhood. " 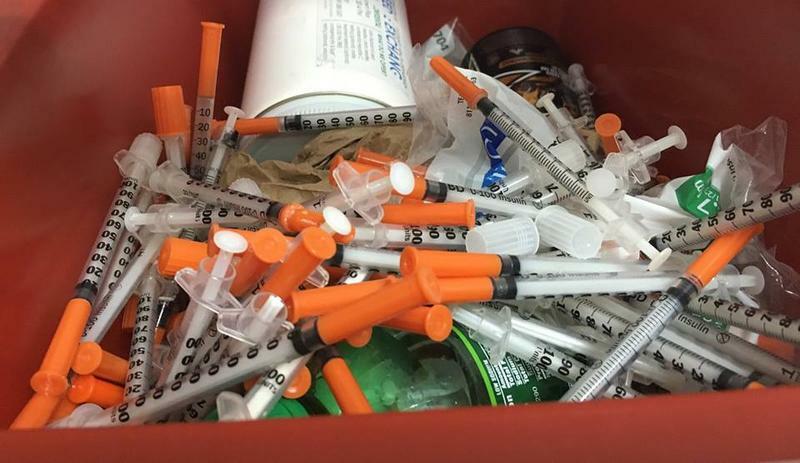 Seaton, a councilwoman in Mullens, a city in Wyoming County, supports the needle exchange and even suggested the health department move to her town. "I think if they're gonna offer that program, it should be somewhere out in the public. ... I know [a rural area] is what they're trying to focus on, but I think it needs to be thought of better," she said. Wyoming County Health Department is thought to be the first government agency in the state to provide needle exchange services in a mobile program. Cox and his colleagues, nurses Gena Carter and Crystal Simpson, pulled into a gravel lot in Long Branch later that afternoon. It's an especially rural part of the county, 40 minutes from the health department. People were outside walking around and rocking in chairs on a nearby porch, staring at the van. It was the team's first visit to this community, and Cox chose to start by building trust. He spent 10 or 15 minutes just talking to people, explaining why they were there. Some clients have said they thought the van was a front for police surveillance. "You need to engage and let them know why you're there and let them know there's nothing to fear. And that's the message that I delivered," Cox said. New visitors must fill out an anonymous, one-page questionnaire. They get a plastic ID embossed with a number and can receive up to 20 needles weekly at a 1-for-1 exchange. 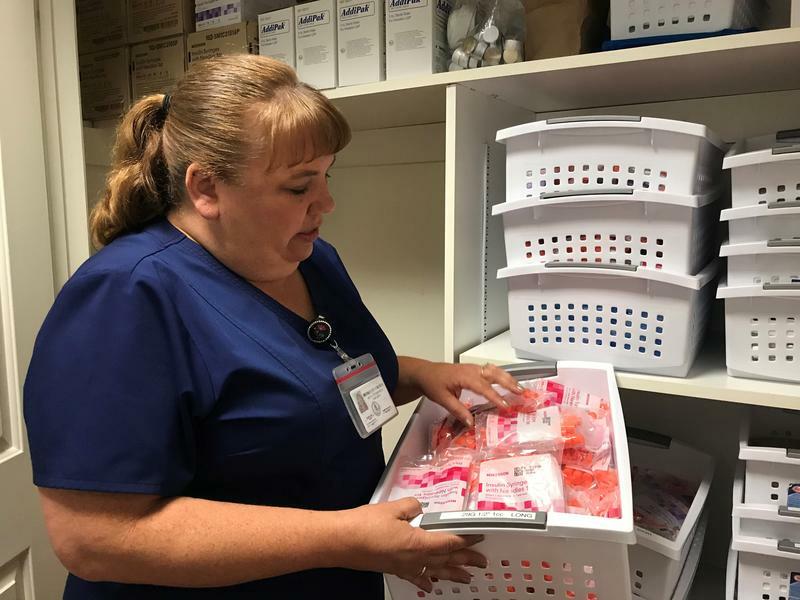 As is standard in needle exchange programs, they also offer a tourniquet, sterile cookers for mixing drugs, cotton balls for straining and a container for the used needles. One woman in Long Branch, who wished to remain anonymous, got a blood test -- and the answer to a question that had nagged her for a long time: Whether her previous drug use left her with any chronic infections. "We've always wondered. I could have cried when I found out it was negative. Oh my gosh, it was amazing. It took a big weight off my shoulders. Always wondering if I had it, it was a scary feeling," she said. She didn't know what to make of the van at first but said she thinks it has the potential to help others in her community. "It's got a bad drug reputation. You can talk to anybody, and they'll tell you Long Branch -- go to Long Branch, get what you want," she said. "But there's some really good people here, and this program could help a lot of people. A lot. 'Cause a lot of those people really don't have the money to go buy new needles." As of last week, the van served at least 50 people. Starting this fall, Wyoming will share the van with Summers, Mercer and McDowell counties, though McDowell's program won't include a needle exchange. 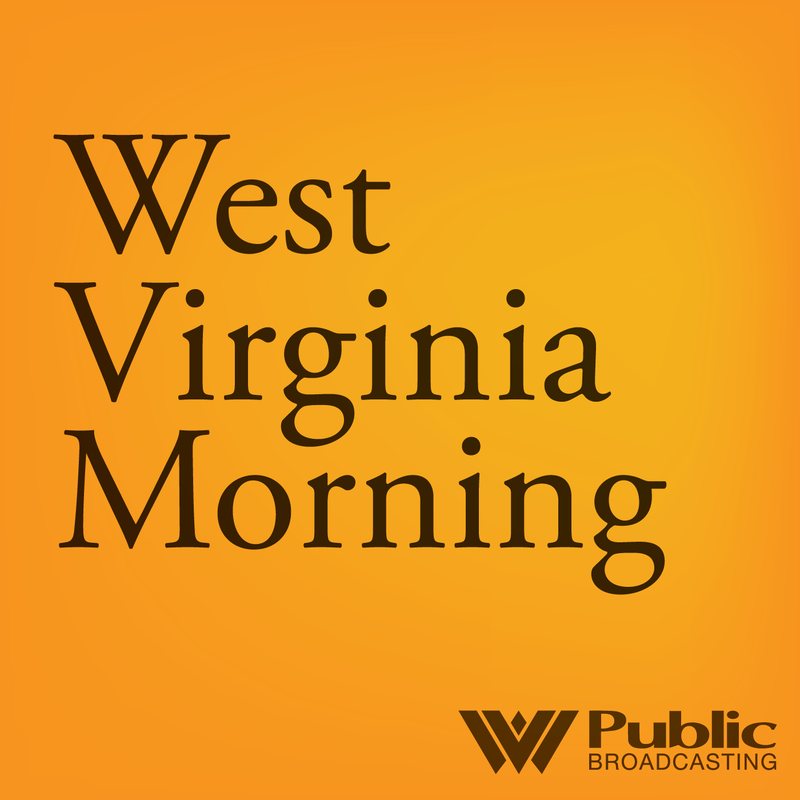 A health department in West Virginia wants an attorney to review new rules that a police chief established for a needle exchange program. On this West Virginia Morning, an Ohio-based collaborative thinks journalists can play a bigger role in solving the region’s opioid crisis. Aaron Payne reports that the effort starts with listening to people in some of the hardest-hit communities.